Stay Dry with the iPlay Pocket Raincoat! How much rain have you gotten in your area this summer? Here in Wisconsin, we are in a MAJOR drought! I can't even remember the last time we have had a significant rain and I really miss a good summer thunderstorm! My son is sad too because he really wants a chance to try out his new iPlay Pocket Raincoat from Mother Earth Baby! When I saw this awesome iPlay Raincoat that stores right into its own pocket, I knew my son would love it and I would too! He loves to wear his rain boots around and now he has a great raincoat to match! He LOVES the fire truck and I love how it stores so easily right into its own pocket. I don't have to worry about keeping track of a storage bag or wondering where to store a wet raincoat where it won't soak everything else! My son waited and waited and waited for some rain to happen and it never did. So finally one day we got a little sprinkle so I quick put him in his rain boots and new raincoat and he was so excited to go jump in the puddles!!! It's a little bit BIG but I am glad to know it keeps his WHOLE body dry and will fit him for a few more years! The raincoat is so lightweight and thin that at first I didn't believe it would withstand against rain and be waterproof. So I brought it over to the sink ('cause of course we have no rain to actually try it in!) and poured water over it and felt underneath with my hand! Sure enough...no water went through and my hand stayed dry! I was so glad to know my son will stay dry too! It is easy to put on with its snap front closure and it folds so small that it can fit in a purse or can be carried by your child by its built-in strap. They have designs for boys and girls so get one for all your children today! Hope you are getting more rain than we are this summer!! 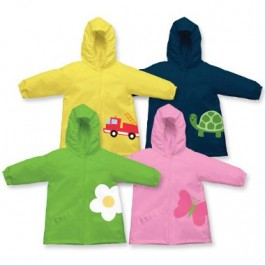 Buy It: You can purchase the iPlay Pocket Raincoat for $13.99 on the Mother Earth Baby website. i take it this is a sponsored review?